More than 500 people die from fog-related car accidents every year according to the U.S. Department of Transportation. 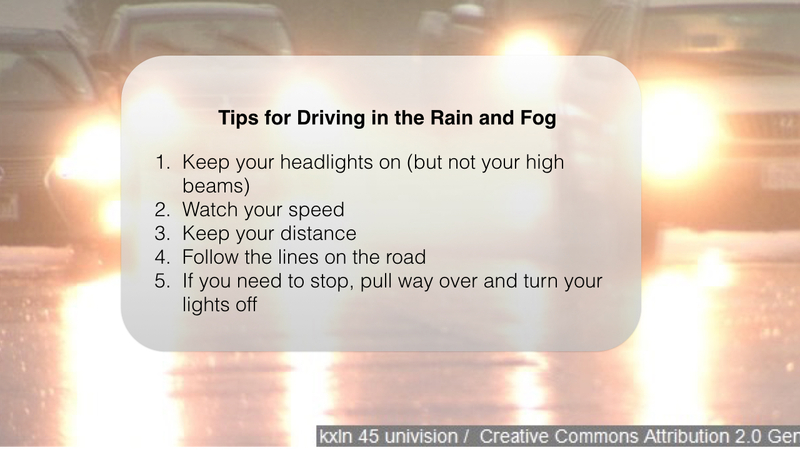 With fog in the forecast this week, these simple tips could save your life. Turn your headlights on, but do not put on your high beams. You may feel that the reflection against the fog caused by your lights makes it harder to see, but it also makes it impossible for other motorists to see you. Watch your speed. Fog can create an optical illusion and make drivers think they are going slower than they are. Fight the urge to keep speeding up. Keep your distance from other motorists. Follow the lines on the road. Our eyes are naturally attracted to lights which can distract you. The best way to stay in your lane is to follow the lines on the road. If you need to stop, pull way over as far away from the street as you can. Turn off you lights once you are a safe distance from the road as to not confuse other drivers. Fog, especially dense fog, is usually temporary. The best way to avoid an accident is to stay put during fog advisories.